Don’t be intimidated by the ingredient list for this recipe. I often hesitate to share “recipes” which I deem to be simply a collection of ingredients assembled using a technique I already know. Maybe they should be labeled “assemblies”, not “recipes”. That’s confusing, though. Ultimately, I’ve decided I should share more of these type of dishes because 1) it’s how I truly cook for many meals and 2) not everyone might be as familiar with methods that are second nature to me, so it helps to have a recipe. That is, after all, how I learned to cook. If you follow enough soup recipes, you’ll eventually understand the order of operations for soup-making, and you’ll just start doing it yourself without a recipe. It may feel like you’ll never reach that point, but I thought the same thing (for years), and you just have to be patient and pay attention to the “why” behind the recipe. 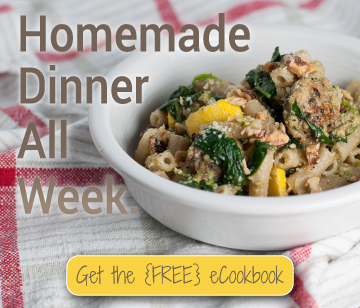 I’ve been cooking for over a decade (maybe two) and it wasn’t until the last couple years that I finally gained the confidence to use all the skills I picked up from countless recipes and start creating my own. Everyone seems to be doing stuffed zucchini at the end of summer, and I purposely avoided the internet, Pinterest, and cookbooks when a GINORMOUS garden-fresh zucchini showed up on my parents doorstep (okay, no, it was not actually dropped on the non-existent doorstep of their condo by some kind of garden vegetable stork) while I was visiting them in Minnesota. Instead, I went with the pantry and my instinct. The only item I bought specifically for the meal that wasn’t already in the house was the artichoke hearts. 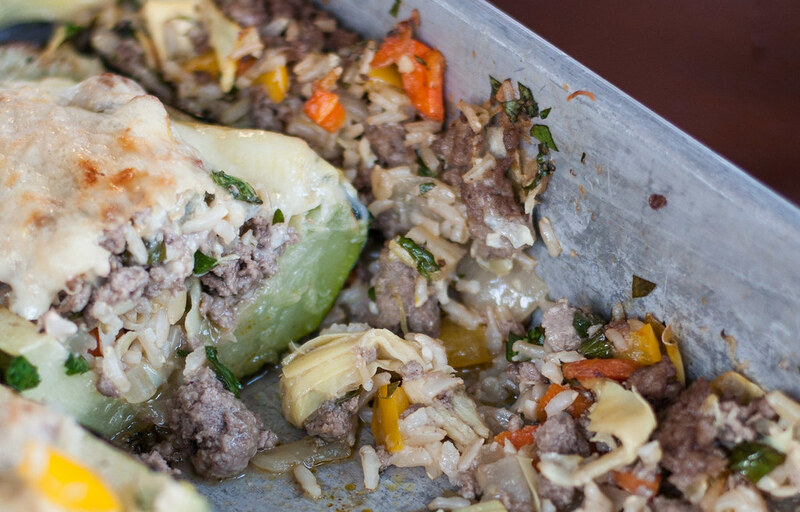 I knew they had to make an appearance, and that their delicate, almost sweet after taste but substantial texture would work well with the stronger flavors of ground beef or lentils, with some rice in the background to complete the filling. That’s a lot of flavor, so I opted for a light combo of white wine, butter, and lemon over a super thick sauce as the overriding flavor theme. If you desperately feel the need to categorize these one-dish zucchini boats, I’d call it Mediterranean with a twist. If you prefer your dinner meatless, cooked lentils stand it beautifully for the ground beef. I made it with 1/4 lentils and 3/4 ground beef. You guessed it–the lentils were alllllllllll mine. I’m very greedy about my lentils. Feel free to make substitutions as you like, especially in the herb and cheese department. 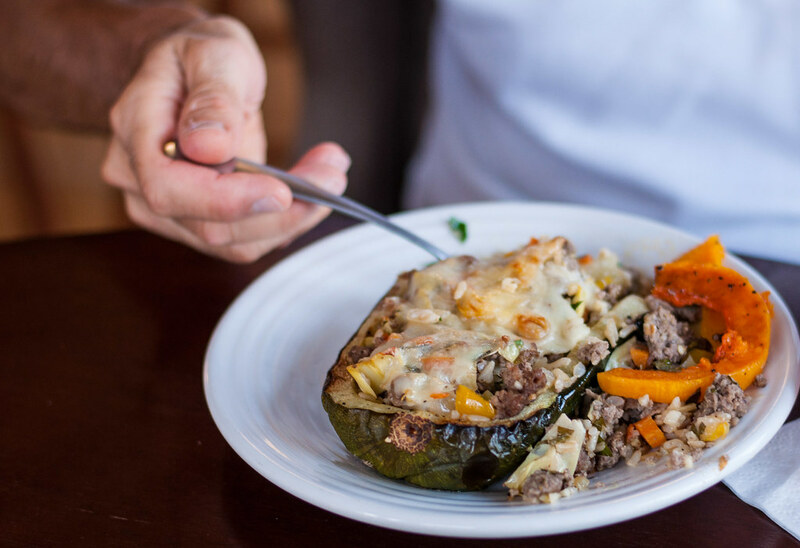 To go totally Mediterranean with the flavors, mix some chopped kalamata olives into the filling and crumble feta, instead of Swiss or provolone, over the zucchini before broiling. 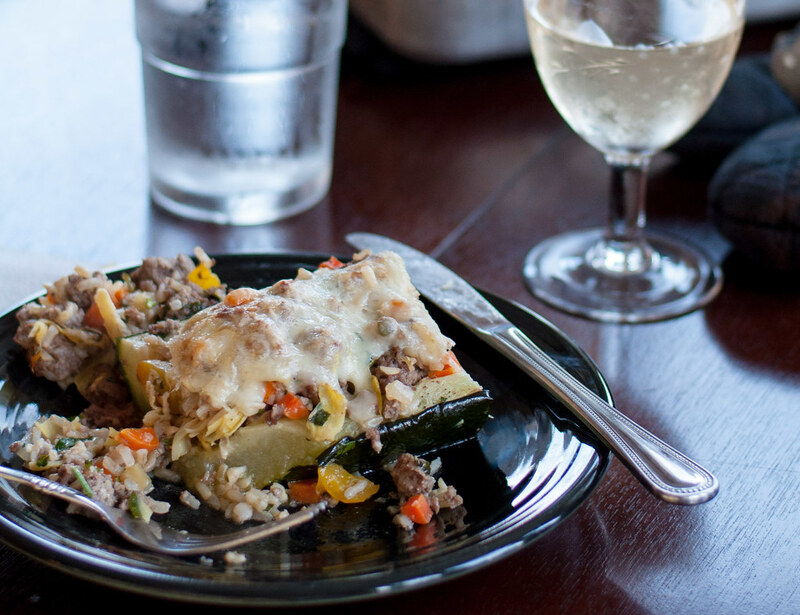 The extra filling surrounding the zucchini serves dual purposes. 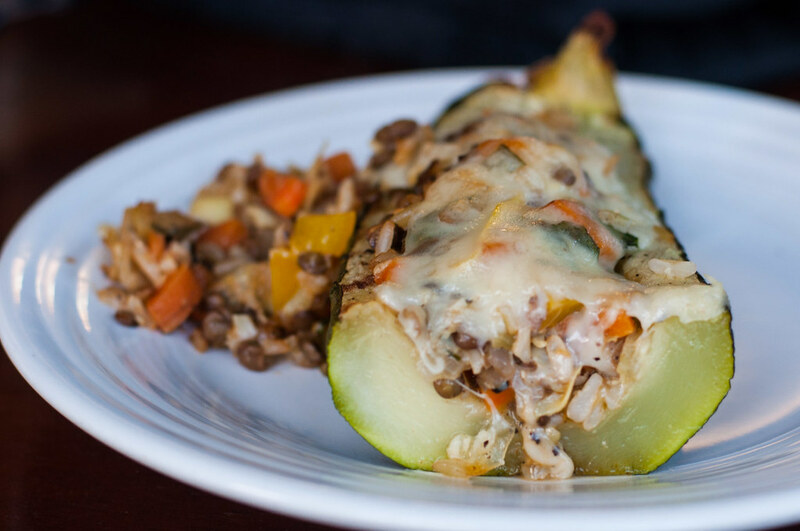 First, it uses up the excess filling that almost always results when making some kind of stuffed vegetable. Second, it takes the meal from light to totally filling, as in no side dish needed. Just keep in mind that leftovers are unlikely if you’re feeding four hungry adults or teens, so plan accordingly for the next day’s lunch if that’s your usual routine! If you haven’t already, brown the ground beef or cook the lentils, and cook the rice according to package instructions. Heat oven to 425 and place rack in the top third of the oven. Halve zucchini lengthwise (without trimming the ends) and use a spoon to scrape out the inner flesh containing the seeds, leaving a fairly thick vegetable “boat” of zucchini skin and flesh. Arrange boats cavity up in a 9×13 pan or similar sized baking dish, keeping as level as possible (use foil to prop up if necessary). Pour a tablespoon of olive oil into a dish, then use a brush or your fingers to thinly coat the cavities and cut part of the zucchini. Sprinkle with salt and pepper, and bake for 20 to 30 minutes, until beginning to brown on top and easily pierced with a fork. Very large zucchini will require much longer roasting time, up to 45 minutes. Decrease oven temperature to 400 degrees. Let the zucchini cool for 5 to 10 minutes in the pan, then tip carefully into the sink to drain some of the liquid. Place cut side down on a clean dish towel or a couple layers of paper towels, to continue to absorb excess moisture. To make the filling, heat a tablespoon of olive oil in a large pot (a Dutch oven or deep skillet) over medium heat. Add onion, carrots, and celery. Cook until beginning to brown, 5 to 10 minutes. Add garlic, cumin, and oregano. Stir until fragrant, another minute or two. Add bell pepper and artichoke hearts and cook for another minute to slightly soften the pepper. Pour in wine, scraping the pan to release the browned bits stuck to the bottom. Increase heat to medium high, bring to a low boil, then reduce heat to a simmer until almost all the wine has cooked off. With heat on low, stir in butter, ½ tablespoon at a time, melting after each addition. Add lemon juice and zest, rice, and ½ teaspoon salt. Stir until mixed. Turn off heat and add ground beef (or alternate), parsley, parmesan, and a few grinds of black pepper. Taste and add more salt if needed. Lightly oil the pan used to cook the zucchini. 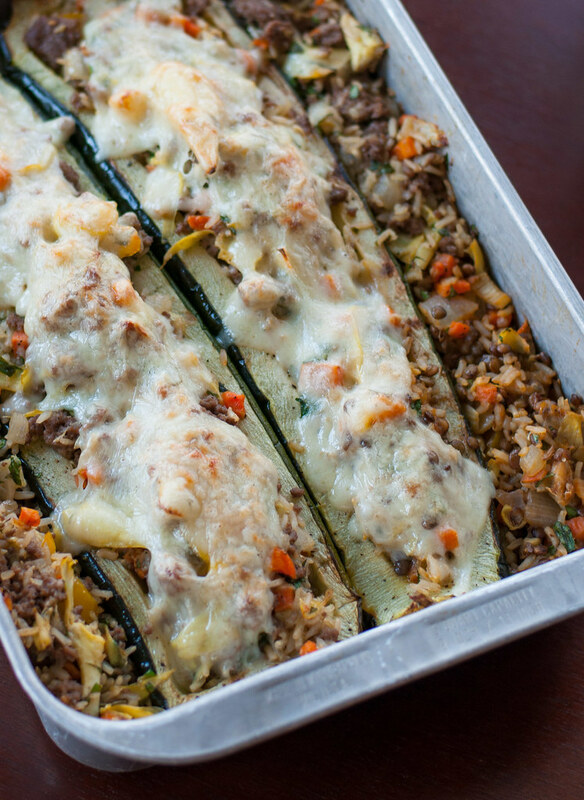 Rearrange cooked zucchini “shells” in the pan, then spoon in the filling, packing it in with a spoon and heaping it above the cut plane. Spoon additional filling into open space in the pan to help hold up the zucchini as it cooks. 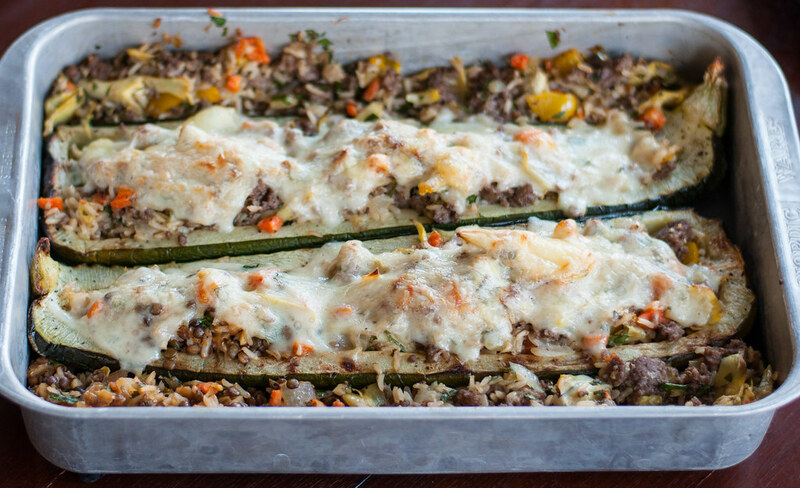 Top each stuffed zucchini with cheese slices (cut to fit, if necessary). Bake for 20 to 25 minutes, until cheese is browned and melted on top (if you don’t like burnt cheese, cook for only 10 to 15 minutes). Cool for 5 minutes before serving, then carefully lift out of pan with a tongs and your hands or a second tongs, to keep the zucchini from breaking or separating from the filling. 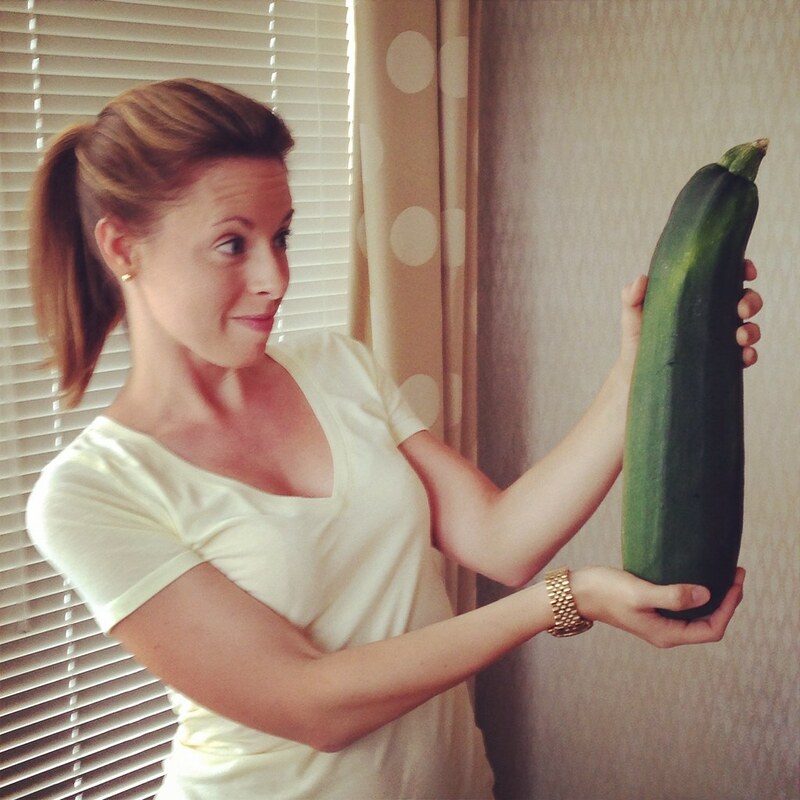 If the zucchini are larger, cut them in the pan before serving. Serve with salt and pepper.